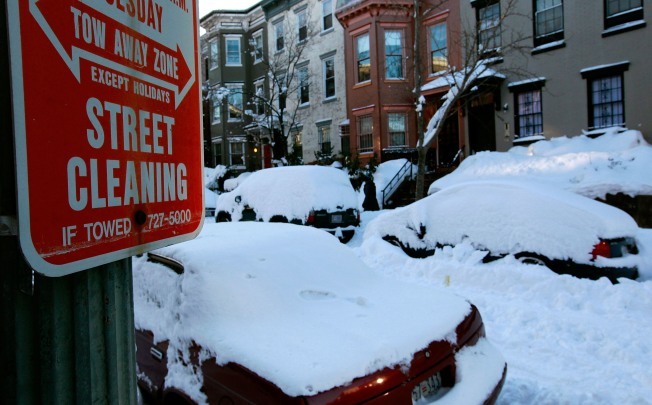 Presidents Day and the snow emergency has changed the trash collection and parking rules in the District. The people at the Department of Public Works have put out a set of guidelines to help clear up the confusion. There is no trash pick up today because of Presidents Day, and all trash collection this week will slide back a day. For those who usually put out trash on Monday, collection will happen on Tuesday. If you have a Tuesday pickup, it will be collected on Wednesday, and so on. The same goes for neighborhoods that have twice-weekly trash pickups. Monday and Thursday collections will happen on Tuesday and Friday. If your normal trash days are Tuesday and Friday, trash will be picked on Wednesday and Saturday. Because many alleys are still blocked by snow, DPW is asking residents to put their trash on the curb in dark plastic bags. Use bleach to repel the rodents, they add. Also, they'd appreciate it if people do not put the trash out before 6:30 p.m. the night before the day of collection. DPW is suspending all recycling collections until next week. The parking rules also changed due to the snow emergency that went into effect this morning. The DC Snow Team is clearing all snow emergency routes. Any cars in the way will also be cleared. It's a hefty $250 ticket plus towing if your car is parked on a snow emergency route. The good news is because of Presidents Day, DPW has suspended enforcement of parking meters, residential parking, and rush hour lane restrictions. On Tuesday, weather permitting, everything gets back to normal. More information can be found on their Web site: http://www.dpw.dc.gov. Scroll down to their Holiday Slide Guide.